I was lucky enough to see a free preview screening of Kingsman a few weeks back and was quite happy to come away from it feeling little need to offer comment (other than insisting that every person I’ve ever met in my life go and see it at the soonest possible opportunity). Even now I don’t particularly want to write about it; I enjoyed it for what it was, thought it did some very cool things with the genre, and look forward to seeing it many more times when it comes out on bluray. But it’s a film built to be enjoyed, not dissected. This review troubled me. Not because I thought the reviewer was wrong: there’s more than one way to skin a film, and pop culture would be a dry and barren place if there was only one valid interpretation of any given work. No, it troubled me because I’m profoundly left-leaning, so how could I possibly have enjoyed a movie that was seemingly just a thinly veiled conservative diatribe? I’m competent enough at separating ideology from entertainment, but if Kingsman was nothing more than a reactionary fantasy then I’d like to think I’d have picked up on that. And yet I came away shamelessly loving it. That alone prompted me to give the movie a little more thought and, far from agreeing with the above, I’ve come away confident that there’s a staunchly anti-conservative interpretation to be read here. Rather than being a movie that looks down at women and the working classes, undermines left-wing leaders and presents a violent, reactionary fantasy Kingsman, in fact, attacks the very foundations of conservatism. You don’t get much more conservative than the original run of Bond movies (a government-sanctioned misogynist taking down people and organisations that threaten the stability of western society), and Kingsman dedicates itself to subverting the tropes of that franchise. It’s for this reason that the story gives us a megalomaniacal villain, and the best villains are the ones whose plans have some degree of logic to them and/or are rooted in good intentions. So why not have someone who’s motivated by the problem of global warming? It’s easy to label the antagonist here as a climate change activist, but that entirely ignores the fact that his plan to wipe out 90% of the human race also makes him something of an extreme right-wing reactionary. He’s not trying to change the world in order to combat climate change; he’s expressly bypassing any change while at the same time ensuring that climate change is removed from the equation. It’s also notable that he’s a mega-billionaire, and the people he’s elected to save include politicians and various other rich, influential types. In fact, if it weren’t for the figures it would be easy to view this as the 1% trying, once and for all, to get rid of the 99%. 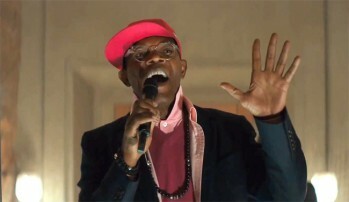 Samuel L. Jackson’s villain wants nothing more than to preserve his way of life, and he’s happy to do it at the expense of almost everyone else on the planet. Sure, one of the people who signs up to his plan is strongly suggested to be Barack Obama. Popularly viewed as a left-wing hero, in reality here’s a president who talks passionately about the need for gun control and the threat of global warming, yet freely authorises drone strikes that kill numerous innocent people every year. 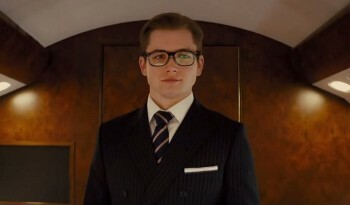 Far from sticking it to a prominent left-wing leader – punishing him, as it were, for being progressive – Kingsman could instead be seen as making explicit that same leader’s hypocrisy and proposing that, despite appearances, he was one of ‘them’ all along. Admittedly there are problems with the movie’s depiction of women; they are typically there for support or reward, their actions defined by the men around them. Some of this comes from the clear desire to subvert Bond which gives us the woman-as-reward at the end as well as a male hero (if they’d cast the lead as female then Kingsman would be little more than another remake of Nikita – not a problem in itself, but completely not what the film is trying to be). However, it’s worth pointing out that the only world leader who is clearly shown to object to Jackson’s plan is a woman; the only candidate who completes the Kingsman training program successfully (albeit at the cost of being seen as completely heartless) is a woman; and the villain’s exceedingly awesome hench-person is also female. Of course, with the key protagonists all being male, you can’t get away from the obvious criticism that the female characters (however strong) are second fiddle and do what they do at the direction of men. However, to say this movie is “utterly contemptuous of women” is a highly directed reading that’s not well borne out by the evidence. And then we have Kingsman’s (supposedly) equally contemptuous view of the working class. There’s certainly a reading of the film in which our working class hero has to adopt the mantle of a True British Gentleman before he can save the day, and this is absolutely reflected in his appearance during the film’s climax (resplendent in his bullet-proof, tailored suit). There’s even an explicit, albeit tongue-in-cheek, reference to My Fair Lady. However, there’s also the reading where, although the raw instinct of the working class hero needs a well-earned dose of discipline before he can achieve anything useful, so the staid, unimaginative establishment needs the instinct and passion of the working class in order to survive. This is represented more than adequately in the final scene between our hero and Michael Caine’s character (Caine’s casting is itself something of an intriguing twist, given that he played the original working class version of James Bond in The Ipcress File). Dismissing the film’s representation of the working class as ‘violent layabouts’ also ignores the obvious point that almost every character in the movie, in one way or another, trades in violence and death. The only crime of the working class here is to be doing it without a cause. As a bit of a footnote, let’s look at one of the film’s most memorable, if not downright iconic, scenes. 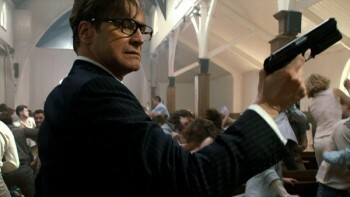 It’s the one in which Colin Firth single-handedly slaughters the entire congregation of a small-town American church (dismissed as “the brutal massacre of dozens of innocent people”). It’s violent, bloodthirsty, over-the-top and absolutely glorious. It might even be one of the best things you’ll ever see. But there’s a significant factor here. This isn’t just any church gathering. this church is clearly meant to be a representation of the Westboro Baptist Church, or a similar gathering of hate-mongers. The scene represents a tricky moral dilemma: how can you have your hero massacre a full congregation of people without completely losing audience sympathy? Easy: have him massacre a bunch of conservative right-wingers that no one likes anyway. I suppose it could easily be read as a revenge fantasy highlighting the violent hypocrisy of the left, but if Colin Firth is intended to be a hero of the conservative establishment then that reading doesn’t exactly work. You could suggest it’s a revenge fantasy being presented by the writer and/or director, but that further undermines the thesis that Kingsman is a deliberately conservative movie. There’s a lot more commentary coming out concerning the film, especially now it’s seen wider release here in Australia. As is hopefully clear from above (and my comment below), my intention with this post is solely to refute the idea that it has an expressly conservative message and not to defend it on any other platform. It’s blindingly obvious that as fun as the film is (at least in my opinion) there are numerous flaws in its execution. Again, see the comments below for some discussion on the BIG problems the movie has with its handling of female characters, for instance. I thought it would be useful to post a link to Andrew Ellard’s ‘tweetnotes’ about the movie (and you should definitely read his other tweetnotes; they contain a wealth of valuable advice for writers). Ellard’s thesis is that the film is never in control of what it’s trying to say and this produces a maelstrom of mixed messages which, for him, introduce huge problems.